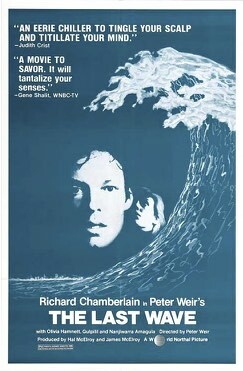 Last night (on the eve of Fathers’ Day, which coincidentally – has been a washout – with pouring rain), I finished watching a movie (with my son) called “the Last Wave” – directed by Peter Weir – featuring Richard Chamberlain, David Gulpilil, and Nandjiwarra Amagula (an actual Tribal leader who was brought in to act, but he also had a say in certain scenes and dialog in the film). It’s reviewed with actual interview quotes from the director himself, here (on FlickeringMyth.com, author Trevor Hogg). There’s also a more recent “The Last Wave Rewatched – Mysticism, Prophesy, and the End of Times” blog entry by The Guardian’s Luke Buckmaster (2014). And I’m sure some good things were written “back in the day,” when the film came out – in 1977 overseas, and 1979 in the U.S. – I saw it myself, in the ’80’s (more than 30 years ago). Most of what you’ll find on the web about this film – understandably – will include a synopsis of the film’s plot. So I won’t dwell on that. Plus, I hope you’ll see it yourself – no spoiler alert – but I will touch on some details of the narrative. What I’m “doing” here, is a different exploration (it’s not a movie review). 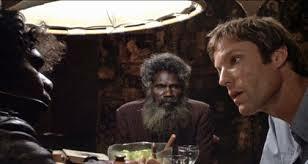 The particulars of the deluvian story are less significant to me than the underlying reality of “the dreamtime” – a conception of the Australian aborigines – which is common to all “original” cultures: that the “realities” of our waking, conscious experience are impacted by, and occur in the context of a vast, shadowy, watery, surreal, indeed metaphysical reality (that is – if you can believe it – “more real” than “reality”). During an angry outburst at his pastor stepfather, David Burton (Chamberlain’s character) accuses the pastor of explaining away the unexplainable, dismissing this enormously significant phenomenon or context (as the popular versions, or most visible proponents of many mainstream religions tend to)…sweeping The Great Mysteries under the carpet…dumbing down The Great Truths into more easily consumed tidbits (for the masses). Playing to the most (or least) common denominator is the way of even the most ancient of civilizations – because we have a society to maintain (after all) – but the outlyers, the visionaries, often the artists, mystics of a community, tend to carry the burden of esoteric knowledge…as does Burton (increasingly)…over the course of this movie. There is talk of how “Westerners” (ie. white Europeans on whichever continent) have lost touch with their dreams, and are limited to a more rigid, tangible perception of reality – as evidenced by the opening arguments of the Prosecution – and represented as well by the lawyer who’s spent more time working with aboriginal peoples (than Burton). Apparently, the area of study “Metaphysics” once included efforts to understand patterns and meaning – not only in the Spiritual world, but also in the physical world – till it was increasingly banished to the fringe…once “proper” Science (with it’s exclusive focus on the results of reproducible experimentation) came of age, a mere few hundred years ago. 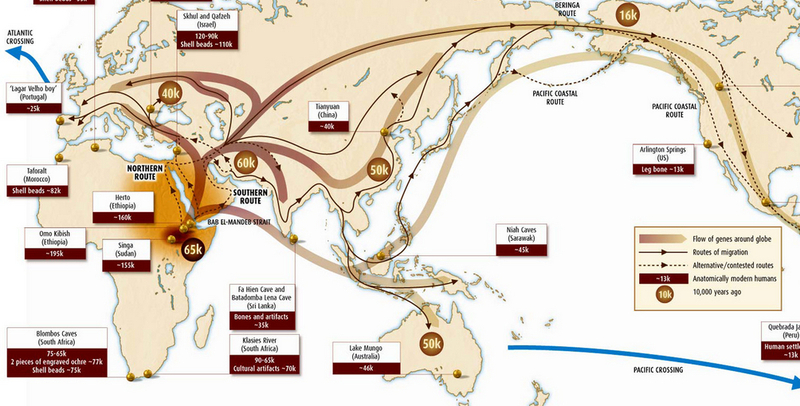 Our history spans far longer – with our own human lineage dating back 3-5 million years – and the first apes (leading to “us”) leaving the forest about 10 million years before that. Modern humans (Homo Sapiens Sapiens) only took current form – originally alongside the larger brain-capacity Neanderthals (with whom I have an intrinsic affinity) – 100,000 years ago. Taking a 25 year (low-end) average life expectancy, or generational period, that’s 4,000 generations we’ve been through – just as we are now – leading up to the present…with a handful of generations going back to Slavery…and even less since the advent of electricity, lighting, universal plumbing, cars (never mind computers)! A continuity of Natural Law – synthesized into Tribal Law – ruled long before there were secular courts…and it was meant to be respected and not broken…which in the case of the guy who dies early on in the movie, results in the meting out the maximum penalty of punishment. Interestingly, this is forgivable – even in Australian Law – if it can be demonstrated that the defendants are Tribal (and not merely “city” people). There is (oddly) a respect for at least one lingering aspect of the “first people’s” custom. At one point, the more seasoned lawyer – in aboriginal matters – chides Burton for his patronizing, high brow (he was actually a tax and corporate lawyer up until then) idealization of the situation, scoffing at the idea that any Tribal people had indeed survived in the heart of Sydney (which of course, it had). Even the most profound understanding can exist in the least likely milieu. 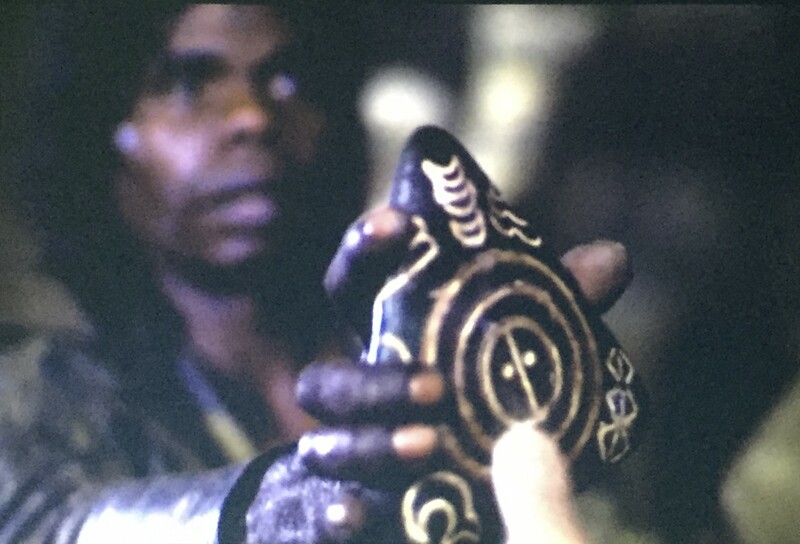 This unlikely candidate to defend the accused murderers (Burton), is also enmeshed in their Dreamtime mythology – an actual “Mulkurul” incarnate – who in the end, finds a death/life mask of himself among the relics of an ancient, lighter complected race that came from the East (the Maya?) and were somehow involved in the foretelling, or even the bringing on of cyclical, cataclysmic tsunamis (great floods). It’s a bit of a clunky jumble of cultures – but hey – isn’t that what our “melting pot” is all about? And it’s certainly a romp through the ages – where past, future, and present meld seamlessly – but what better blend could a New Age hipster hope for? Now I don’t want to fall into romanticizing original cultures – as wonderful as they are – there are downsides all around (and I don’t pretend to believe that living 20,000 years ago was a walk in the park). Likewise – though I see the paramount importance of recognizing a Natural Law whose violation is resulting in our own progressively harsh Judgement today, through climate change – I take issue with people projecting their own idiosyncratic, subjective comprehension of The Law with their own fabricated law (and imagining that it’s the ONLY law). We are all entitled to our own experience of The Golden Rule – both fortunately and unfortunately (because people often choose a self-serving interpretation of it) – and as serious as we take it (thinking of it as universally applicable), we still must recognize that our fellow co-habitants of the planet may have equal or opposite views (which they feel as self-righteous about). It’s important to remember that before the Romans, and later, the Roman Catholic Church (note the continuity there) took over Europe, there were myriad languages and Pagan cultures thriving independently (hello: Stonehenge!). As the movie shows, it’s false to consider even a straight laced English lawyer to be immune from having a tribal clan in his past (or present!). The Aboriginals know and accept this. Reality – particularly the Dreamtime – supersedes the superficial, and weaves together disparate elements into an impossibly rich and magnificent fabric of “true and complete” Reality…too complex for most people to grasp…and too wild for even the few to harness, completely. I’d like to think Shamans, Healers, even Doctors, Lawyers, Teachers, and Garbage Men (indeed Mothers, Fathers, and Children of all stripes) – we all have the capacity to comprehend (or at least access) – the Great Mysteries…and each of us – in our own ways – have adapted to and “tamed” them to some degree, to serve our own purposes (and ideally, the betterment of others). In closing – I’d like to thank the community that made “The Last Wave” possible – and gratefully pass it along, like Life itself, to the next generation…to love and to fear…to struggle with, and to try to make sense of (in whichever, small way). 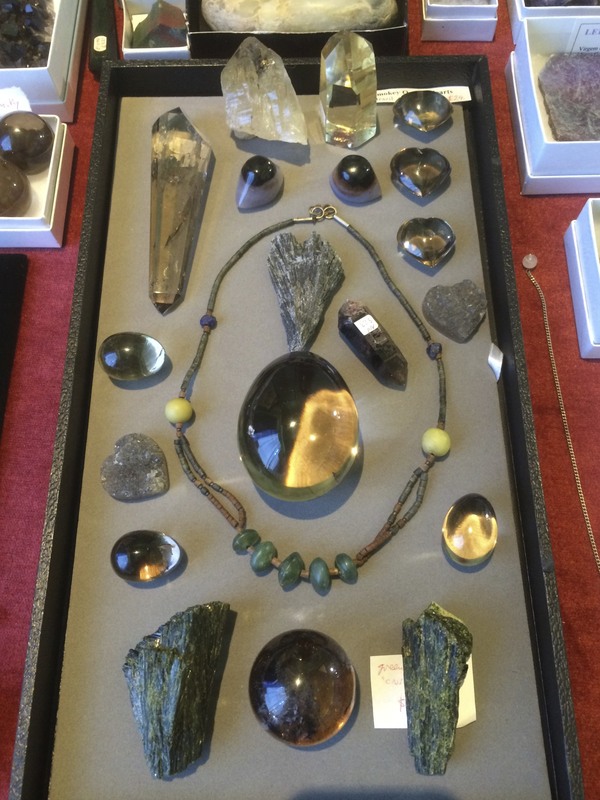 About the Author: Kyle Russell has been working with Crystals for 30 years, and considering Matters of Spirit for far longer (including other lifetimes). 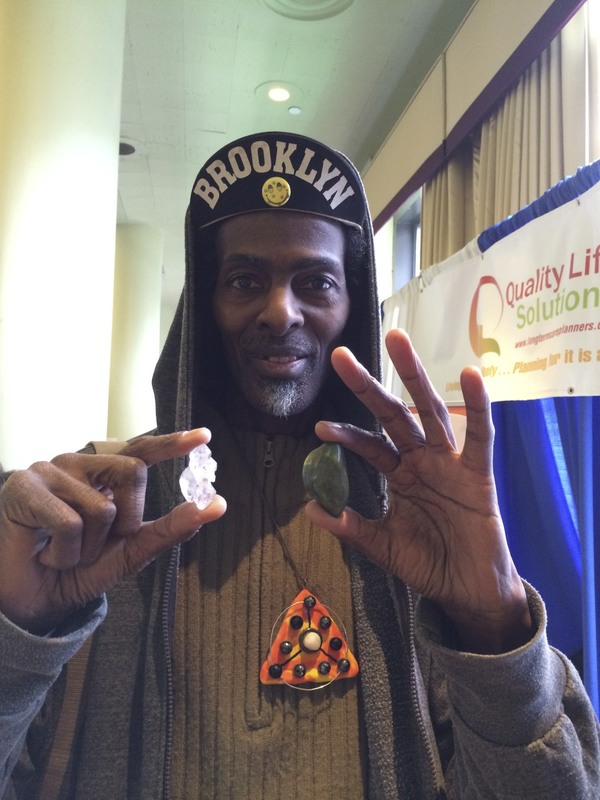 He mostly write about Crystals from the perspective of his modality Crystal Concentrics, which he teaches and uses through Meditations, Classes, Writing, Social Media, and via Individual Sessions. 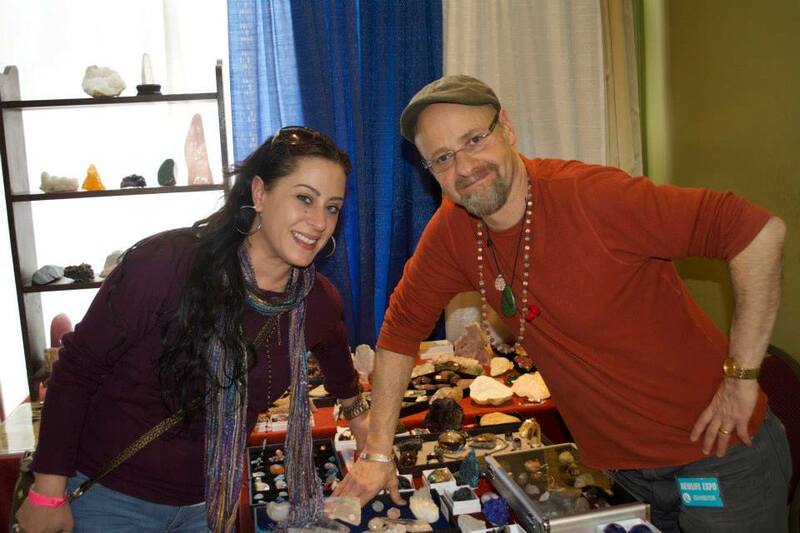 Russell also buys and sells Gems & Minerals through his http://www.PowerStoneCrystals.com site and at metaphysical Expos. You can reach him easily at Kyle@CrystalConcentrics.com. Most of you (readers) are on the other side of the table… browsing like bees – going from flower to flower – exhibitor to exhibitor. Yours is the choice. It’s a buyers’ market. If a vendor’s display (and selection) doesn’t suit you, you’re movin’ on! I thought it would be enriching if you had a glimpse into what “we” go through. Hence, me writing this particular Blog. But a story is never just a story. It’s all about what we learn from it – or wish to convey (or “teach”) – through our experience. A few weekends ago was a textbook example (for me), of what it’s like to showcase at an Expo. 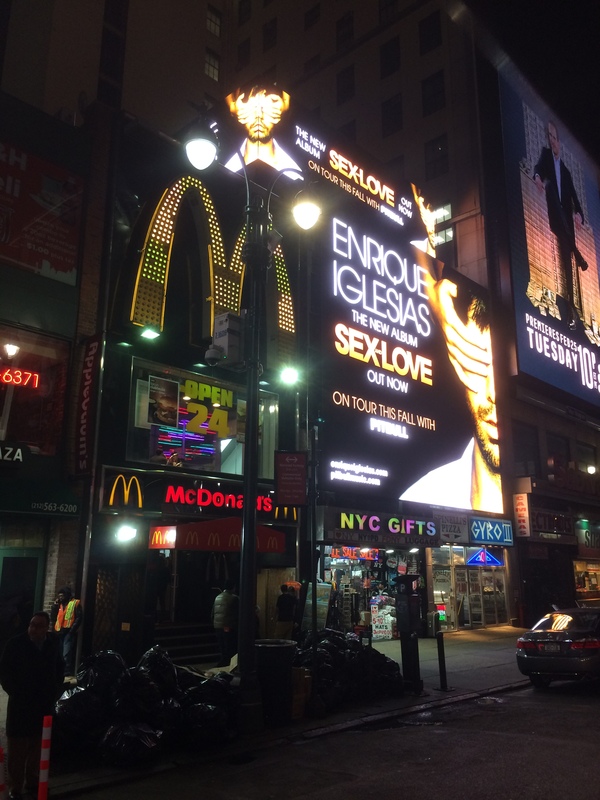 Part of what made the experience particularly special – for me – was the fact that it was the first such show I’ve done in New York City. I’d been there before, to wholesale to shops – 20 years ago – and also to perform, as a musician (more recently)…but this was different. You can be sure it crowded my mind for weeks, leading up to the event. I bought new product – specifically to fill out my inventory for the occasion – I wanted to impress! That entails selecting, buying, transporting, unpacking, pricing, photographing, and the uploading (to the web) dozens of specimens (cause that’s what I try to do with everything I get…put it through my inventory system). I also decided to overhaul my display M.O. as well – so I purchased velvet trays and pads – as well as a carrying case. 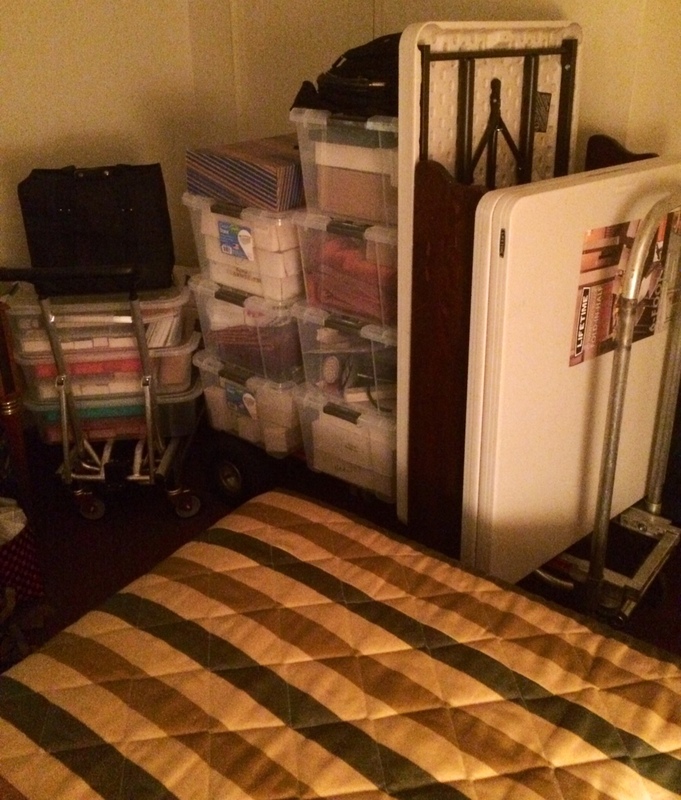 I laid out all my flats and boxes in advance, choosing only what would fit onto the two dollies I was bringing. I had a 6-foot-wide by a 9-foot-deep space to fill. That’s an odd dimension, and took some advance planning. The organizers had promised to provide a 4-foot table, which turned out to be a 6-foot table. That would have been good news for some folks, but not for me, ’cause I’d mapped out every square inch in advance. I figured it out, though. It helped that I had gone to Costco, and purchased an actual 4-foot table, as well as a 6-footer – of which I’d already had two – but this newfangled one folds in half (which is nifty). The goal is to streamline and to simplify, going forward – to make your life easier – because you can be sure challenges will come up, unforeseen. Like how was I gonna unload into the hotel from a busy downtown side street? If registration as a vendor was required before I could even load in, who was going to watch all my stuff (or my car!)? And where, exactly, was I gonna fit an oversize vehicle (my full sized passenger/cargo van is about 7 feet tall) in a city than can barely accommodate “normal” driving machines? Enter the brilliance – and generous response – which came from my asking my friend Nigel to come along. 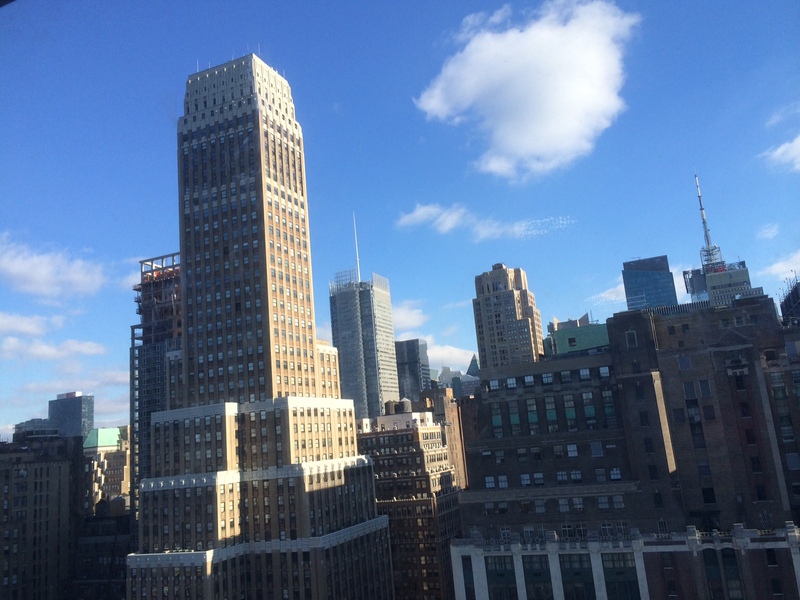 I’d reserved a 2-bedroom suite, on account of my family coming, but it turned out they couldn’t leave town. So I offered my bro from the music world the opportunity to have a weekend in the city – to do whatever he wanted – which he did(! 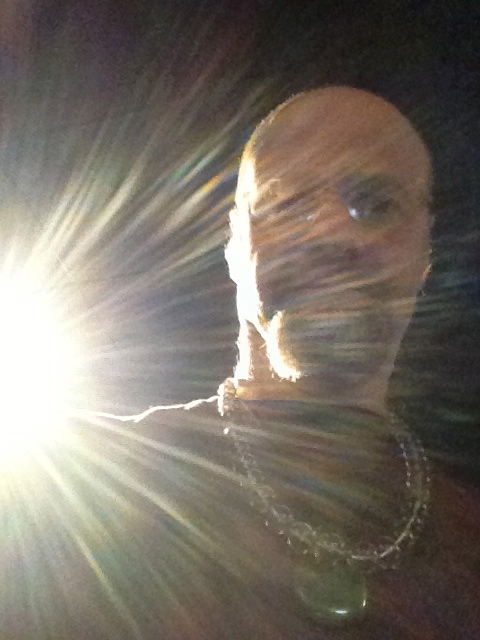 )…so long as he could help me load in and out. He even drove us part of the way back (what a blessing)! We’d been meaning to catch up for months, so that was just fine by us, and it turns out he made some great connections of his own (at the Expo) that weekend. I’ll only mention in passing that the hotel didn’t have my reservations (I’m finding this out at 11:15pm, after we’d just rolled in) – or that when Expedia lopped off my 4th night there, I ended up paying more (for the 3 nights that I did stay there) than I’d been on the hook for originally (for 4 nights!). Snafus – things you can’t anticipate, and couldn’t begin to include in the price of your product – but they’re costs nonetheless…the cost of “bringing Crystals to market.” I hope buyers recognize that we vendors absorb these myriad tangible – and emotional costs – wishing (sometimes fruitlessly) to make them up on the “back end,” with some big sales. One of my fellow vendors reported more in sales to one big customer than all his others that weekend, combined! 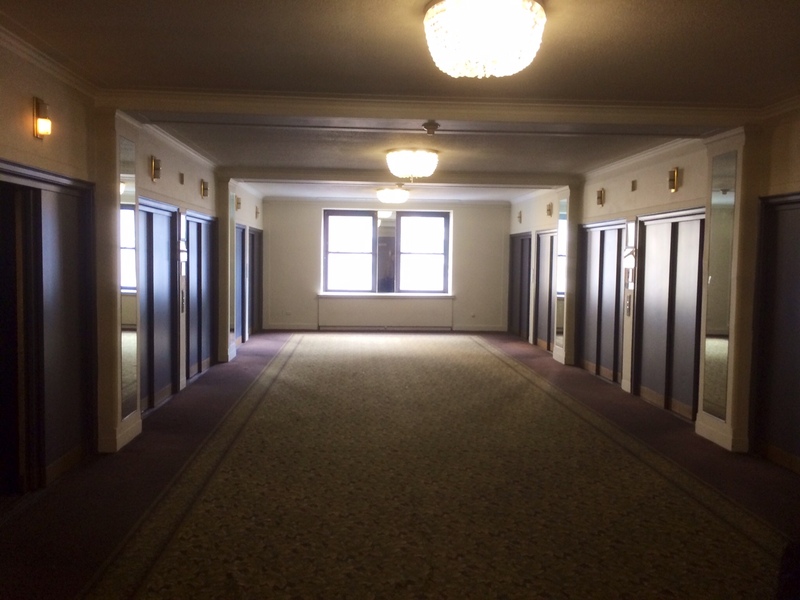 As we were pushing my 10 large bins out of the freight elevators – on the 18th floor (a bellman had gruffly sent us ’round the back when we tried to load in to the main elevators) – a different group of exhibitors was loading in too. They asked us what we were selling. 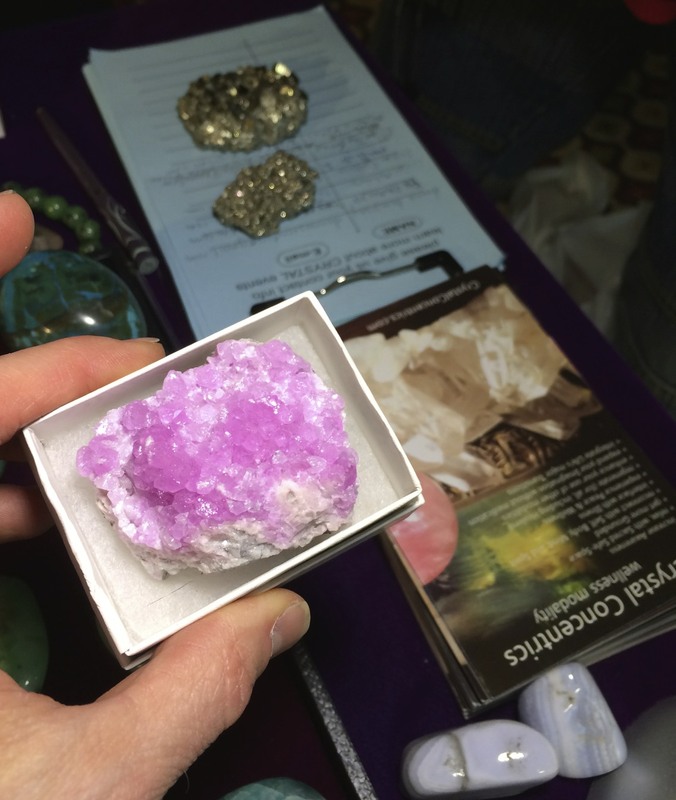 They were not pleased – since after having been told there were “only 2 Crystal vendors,” there turned out to be about 4 major vendors – and another handful of exhibitors with meaningful crystal displays. It creates an atmosphere of competition for everyone (when there’s already lots of folks selling “the same thing”) – which can be healthy – and good for you buyers. But everyone selling sees their earning potential drop. It also hurts our (needed) margin when buyers get to pit us against each other for the lowest prices. Don’t get me wrong, I’m all for the end buyer’s benefit (hello: I’m a retailer) – but part of my mission in telling this story (can you tell?) – is to demonstrate the types of liabilities & costs we encounter at every turn (as vendors). Fortunately, everyone was selling something a little different. And everybody had their unique strengths. But without an unlimited audience passing through, there’s only so many dollars to go around. If they don’t spend it with you, they’re spending somewhere else! I got one “insult” (that’s how I heard it) – “you’re the most expensive crystal seller in the place” – from someone who’d just walked away, after making a purchase (from me!). He and his wife had come by and hammered me on pricing earlier, but then walked away – even after I dropped the total (on just 2 pieces) lopping off 20 bucks – which turned out to be a whopping 22% discount! Most vendors are stretching it, to give you 5-10% off. I’ve seen it, cause I’m a buyer too (and they know I’m a dealer). I enjoy giving breaks in general, but in particular when someone’s really enthusiastic, and buying multiple pieces. I was actually rattled by that experience, though (and that doesn’t usually happen for me). A buyer from the previous day came by (very happy, with his new necklace, which he’d gotten from me ), and I confessed (after saying something nonsensical): “I’m a mess.” I drove 4 hours Thursday night, and then we loaded all my stuff up to the room, going to sleep way after midnight. Friday, I set up from 10am till 3:30pm, just taking things out and organizing them. That’s over 5 hours on setup! You couldn’t tell me to set up any faster. Some things take the time to “do right.” I didn’t just lay bins out, or put out jewelry boxes…I took everything out…and put all into play with that new velvet-pad display-system I mentioned earlier. 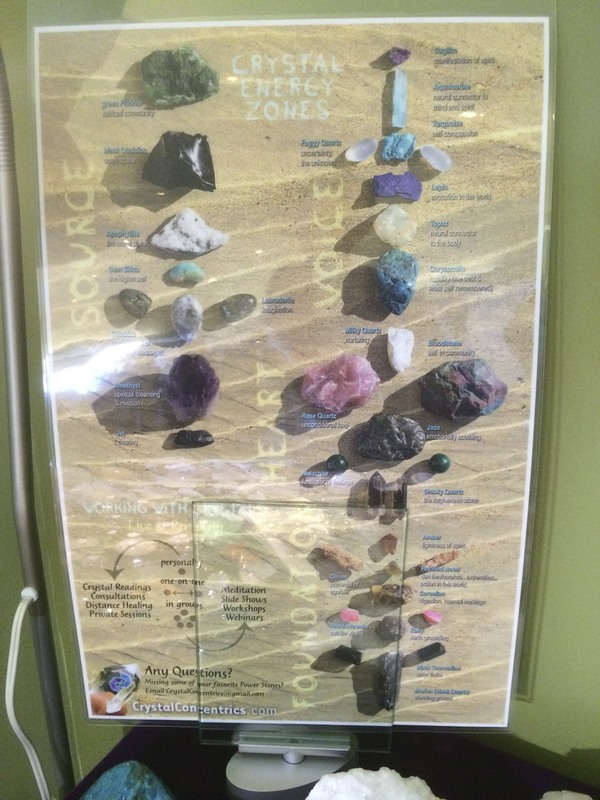 I was also excited to put out my new Crystal Energy Zones poster – which I’d created specifically in time for this particular Expo. It condenses the various Chakras down to 4 key areas, all all of which are pertinent to the human body. 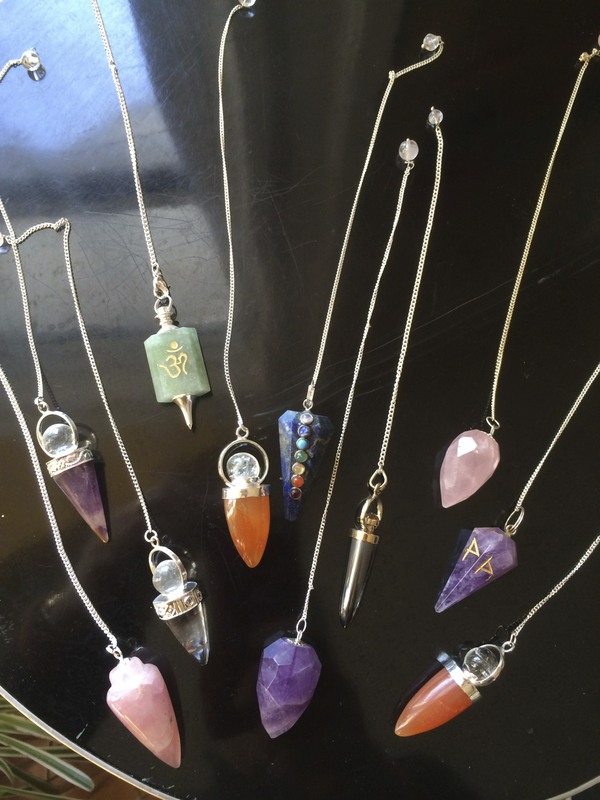 These are “populated” by the 29 varieties of power stones I find essential to working with our own energy system [email me at CrystalConcentrics@gmail.com to get your copy]. The place was open to the public from then (3:30pm) till 10pm on Friday. That was another 6.5 hours on the floor – and I had just one meal throughout (and one bathroom break) – from start to finish! I’m a big eater, but you can be sure my stomach shrank to accommodate the long intervals between meals. I wish I had photos of them all – there was the African sorghum meal – the Chinese Indian dish – and even raw coconut (which tided me over each afternoon). On Saturday, the hours were 10am till 9pm (count ’em: 11 hours); and Sunday was 11am till 7pm. With the long drive home to Boston looming ahead – after a 2 hour load out (that turned Sunday into a 16 hour day) – I had earned the right to reach the end of my tether. Fortunately, this guy’s friend – whose sweater I’d complimented – offered (and delivered) a 5 minute Chi Gung massage session right there, with us standing in the aisle. It was heavenly, actually, and revitalized me…mostly to receive positive energy from someone who wasn’t trying to undercut the value of my hard work and display efforts. 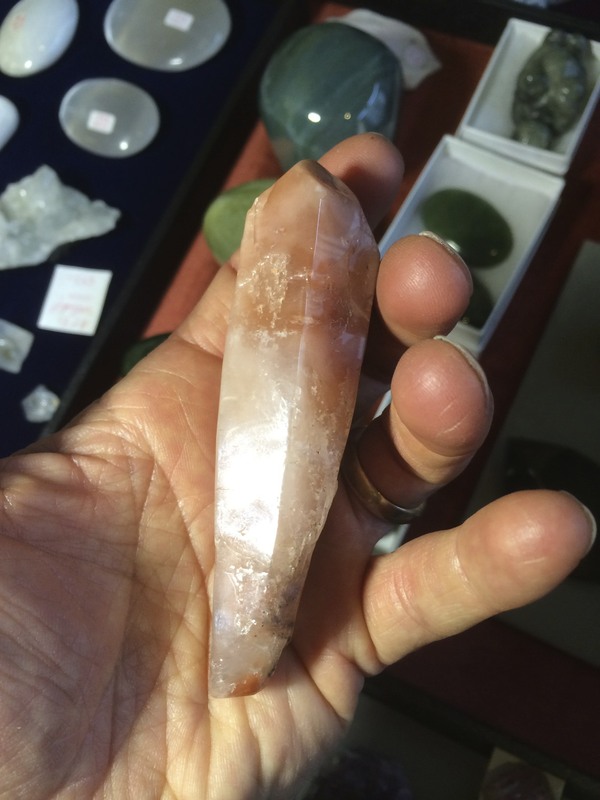 I take this thing quite seriously – I’m gonna share with you a blog soon about the life cycle of a crystal: how it gets into my possession, as well as what it goes through before it gets into your possession. You’d be surprised by the number of hours (and dollars) that goes into developing a selection the likes of which I’ve been showcasing at events lately. I was vindicated that after having frequented all of those other vendors, those prickly buyers returned to me because guess what – they didn’t find what I had elsewhere – and they ultimately came to appreciate the value of my pieces (though they wouldn’t admit that). At other shows, my average sale is $30-50, but this time it was $50-100. That’s not because people are buying a dozen $5 stones – or three dozen dollar pieces – I don’t carry those. My pieces start at about twenty bucks because too much less isn’t really worth the time I put into them. My niche is to shoot for a cut up – just over the average – including both the stones I acquire & the collectors I’m aiming to attract. I’m catering to folks who’ve been around, who’ve seen most of what’s out there, and are searching for more – for special – for unique. And that doesn’t have to be big and pricey. Take for example, my new friend Quasi’s purchases: a small Polar Jade piece (with its own type of texture) & a family of DT’s floating together like Herkimer Diamonds (which came from Morocco). He makes pendant breast plates, and these were just right for him. Alternatively, I also sold some very special, more expensive pieces. Take for example this rare, crystallized, green Prase Quartz I called “Galactic Mountain Range.” Coincidentally (and happily), I sold another, single “point” of this material online that weekend. But that was about as expensive as I expected to go. 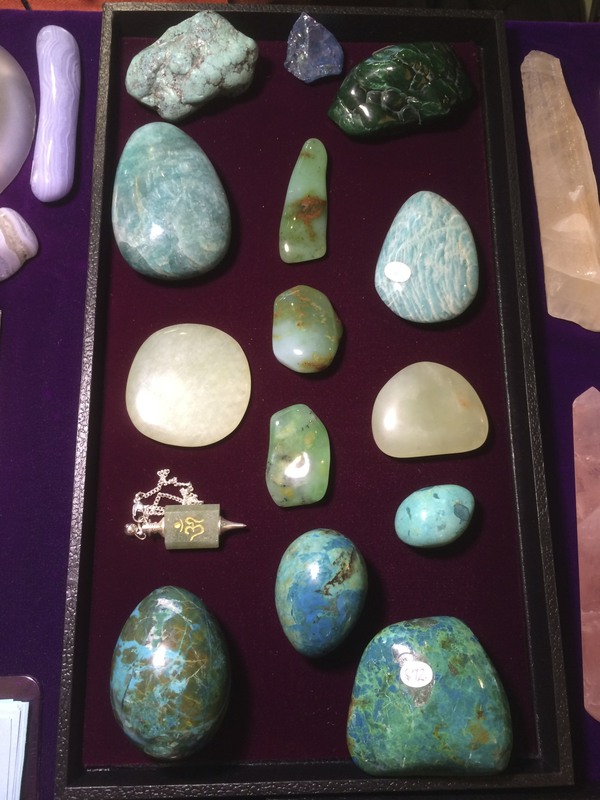 Most people – except those in the know, who were really curious – didn’t even notice my Ethiopian Opals (which run even higher in price range). I barely have any Crystals that can fetch over a G. And that’s on purpose. Yet I saw some items pushing over $1000 mark – even stretching into the several thousands – at other booths. One visitor even complained (regarding another vendor) – about an item that seemed way out of proportion in price – relative to smaller pieces of that same material. To the vendor’s defense, I’d have to say that larger pieces are sometimes more rare, and cost more than their aggregate weight in smaller stones, because it’s hard to find that variety in larger dimensions. All and still, it was oddly reassuring to notice that “fault” can be found with every vendor. Nobody’s perfect. I do have a pet peeve – though – about strange, incongruous pricing. I try to have an internal logic behind the price of every single piece I carry. If you care to know, I can explain it to you (for any and every item I carry). I don’t price based on a blanket markup – as I imagine most people do – particularly wholesalers, who can’t be bothered with sorting through their lot (that’s our job, as retailers). I price each piece based on a variety of factors. There’s size, color, texture, rarity (even within its type). Purchase price, replaceability, and personal “wow” factor all matter. All these variables come into play…but this internalized list (the “axes of analysis,” as I call it) goes on and on! It would be hard to capture in words. There’s ultimately no substitute for the years of experience I bring to my pricing (and selection!). The competitive vibe among sellers is actually something a lot of us have been overcoming (especially at the bigger shows). It’s so petty when venues block healers from reaching their audience, or sharing what it is they have to offer. For all intents and purposes – if they did “open the gates” – the new arrangement would have every promise of creating a win win situation (for all of us). But no, we all want to be gatekeepers. “If you want to buy or be well, you have to come through my portal.” Sounds like Religion (but I won’t go there). I find that it breaks the ice – with all but the most negatively minded people – when I buy from them, even at retail (though I certainly prefer – and merit – wholesale pricing). I’m an omnivorous buyer, I go for the good stones, wherever they may be (and whatever they cost). I love the light hearted comradery that happens “on the floor.” There’s a sense that we’re all in this together – and that when we’re travelling from afar – we’re at the mercy of the organizers (who are ultimately “responsible” for bringing people through the door). Indeed, there’s a little bit of an “us vs. them” feeling amongst the vendors, relative to organizers. It shows up in how we react towards the space we’re given; or even down to how the electricity is served up. 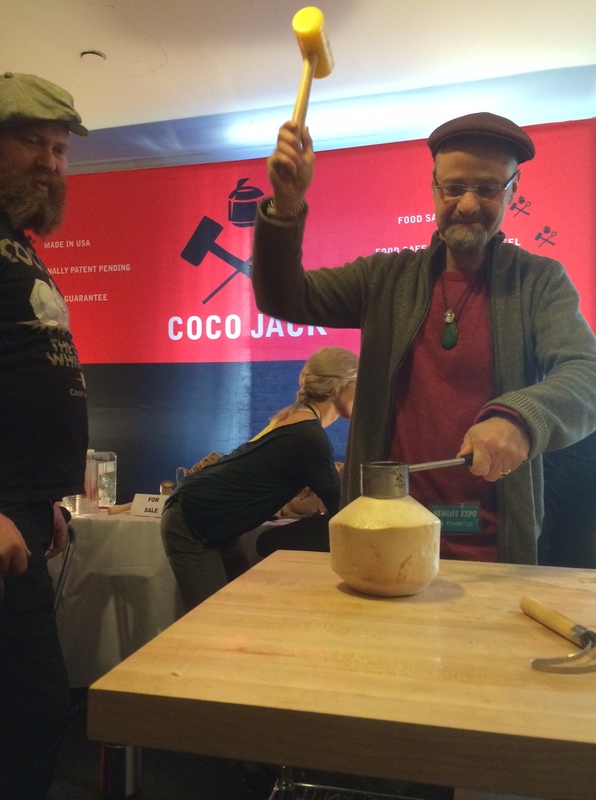 Hospitality matters too – and shows up in areas such as making a special food line for us vendors – vs. relegating us to fending for ourselves (as if we were in the wild), amidst the throngs of festival goers. Please don’t think that because some rocks sell for $1 to $3, that all rocks cost – or should cost – that amount. I’ve spent hundreds of dollars on purchases I have no guarantee will ever sell. That’s what you do when you’re really into it. Be driven by the product, not the cost. There are more important things to life (and Crystals) than the numbers. It annoys me to no end when people just look for the price tag, and then drop the piece, as if it has no other intrinsic worth than the dollar sign sticker which is stuck to it. 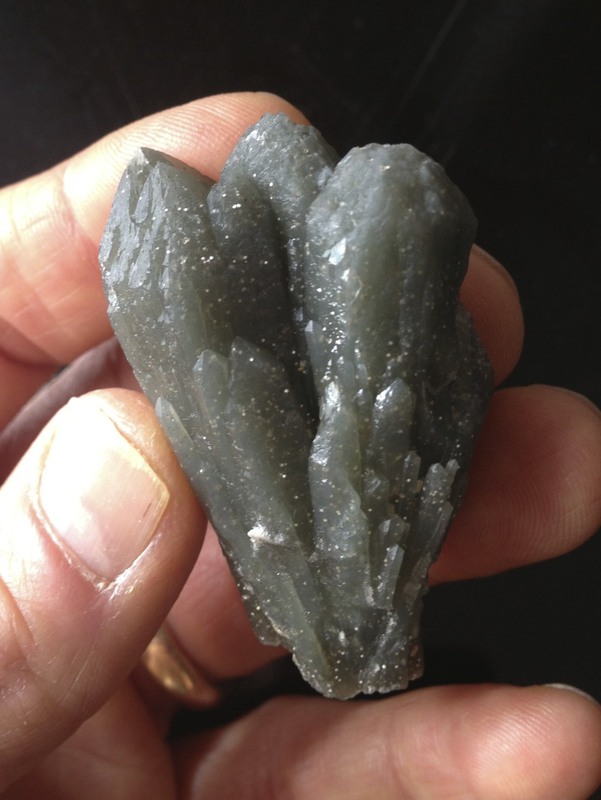 Another pet peeve I have is when people come up out of nowhere – as they did specifically at this show, searching for Shungite – and ask “do you have such-and-such?” Just ’cause somebody’s written a book about it recently – extolling its virtues – doesn’t make it the best thing since sliced bread! When it’s revealed that I don’t have it (whatever it may be…”Natural-ite” was another favorite…that made me laugh), they disappear again. Never mind that I have some of the best specimens of the key, classic varieties (and some hard to find rarities too) right there for the viewing, which they’ve completely overlooked. That just shows me they’re into the trends, and have no real depth to their interest in Crystals. Back to pricing – I have a pricing paradigm that I’ll share with you sometime too – it’s a way for you to understand better what you should expect to get for under $10 (as a retail buyer) – between $20 and $40; $50 and 90; over $100 – and over $200. Another insider tip on my M.O. – if I don’t believe in it, or even get it – I don’t carry it (which I suggested above). Take pendulums, for example. I don’t use them, but I know many who do. And I appreciate their aesthetic, as well as how helpful they can be (if you are into it). So I buy the best I can find – but not an overabundance of them – and I do display them. 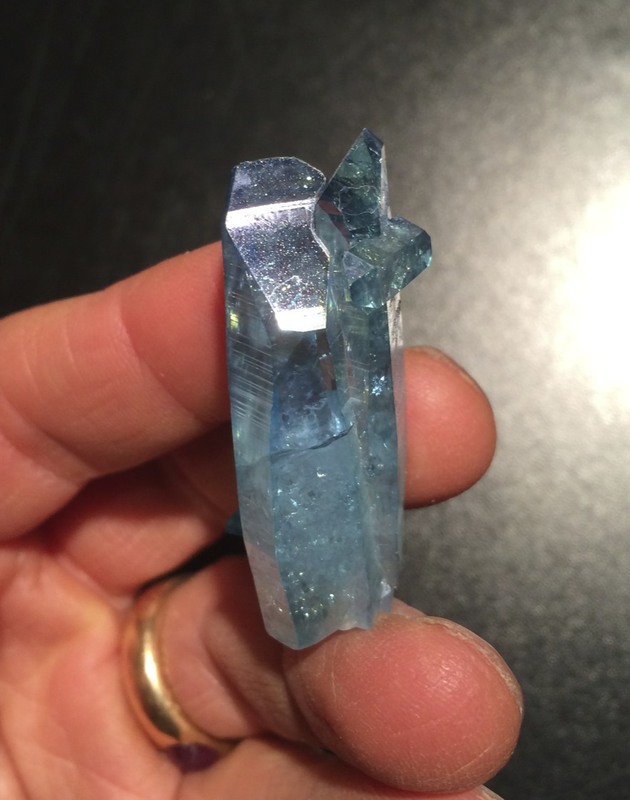 Another variety I don’t use personally – but recognize the power of – is the treated Aura Quartzes. Precious metals are powdered, and fused to the surface of Quartz in a vacuum, at high temperatures. I’ve noticed they can become quite brittle – but they’re oh so pretty – and have a special, different, and larger than life aura. My mainstay are real specimens – including polished pieces – which I don’t necessarily consider “worse” than rough minerals. I had a couple of people call me “hard” because I couldn’t go down indefinitely on the price of a standing Amethyst mini-cathedral. I’d rather hold onto something – wait for someone who appreciates it – than give it away beneath cost (or at a price that really doesn’t respect the piece). Having been in the business 25 years, I know what will and won’t come around again. Enough of my bellyaching! I don’t want to lose your ear – you’ve indulged me this far – but to get what we go through, you really have to understand this psychological tug of war that’s going on between us and folks who really don’t get it. I had this same experience in the music business, where folks think you’re just “playing.” They don’t see your doing years of rehearsal, schlepping, late nights, driving tired behind the wheel, banging on doors for gigs. It ain’t easy work, but (somehow) we keep at it – we actually love it no matter what! To tell you the truth – it’s self sourcing – energetically. 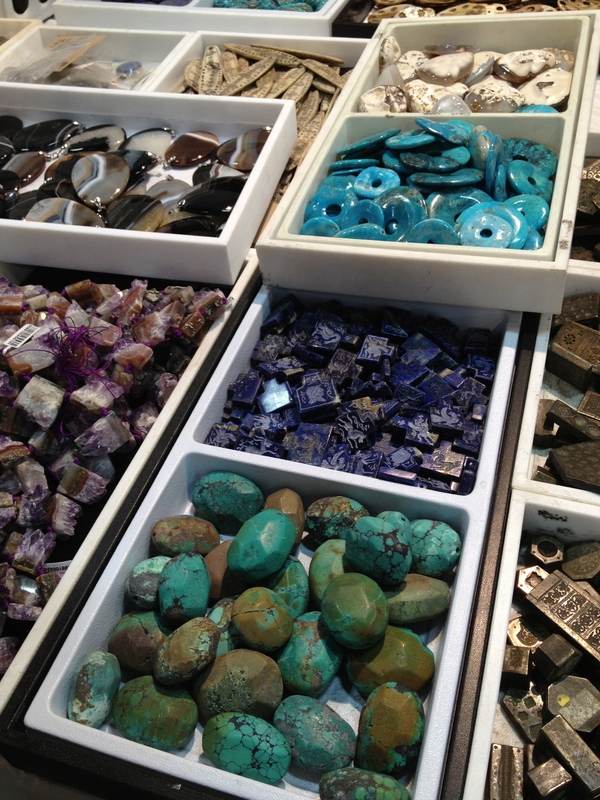 I could be around Crystals (and all of what that entails) every single day, all day. Some of my best stretches have been spent exactly that way! But you know the other reason we do it (and put up with all the BS)? It’s the folks who do get it, who recognize what you’re doing (and what it takes to deliver what you’re delivering). They make it worthwhile. When I thought all was lost (that Saturday), and that I had no hope of recouping my expenses (never mind my product cost, or the worth of my time), I had a handful of good people come through. I’d just met them – for the first time(!) – and that carried me through. 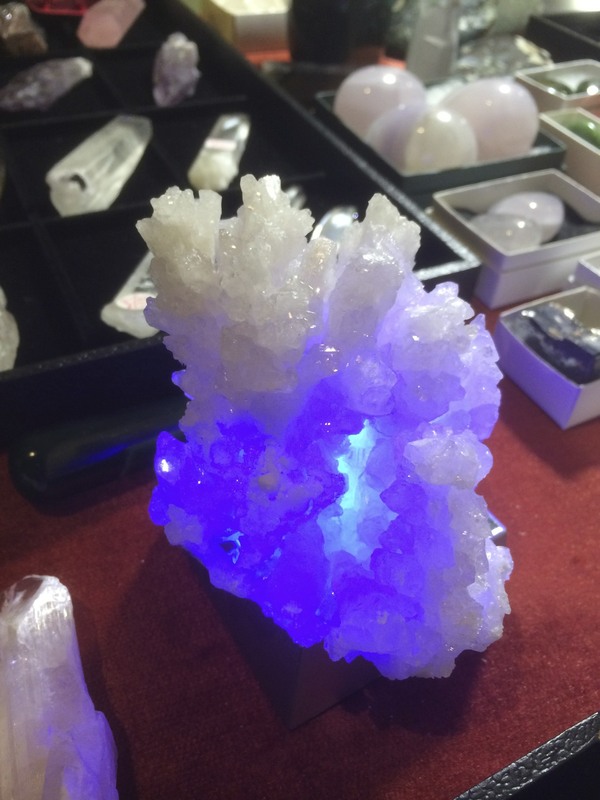 Take also, for example, these encouraging words from a colleague afterwards: “You had a terrific display (and at least three attendees remarked to me that your crystals were of much higher quality than anything else at the show)! I think you really brought something special to the floor.” Feels good!